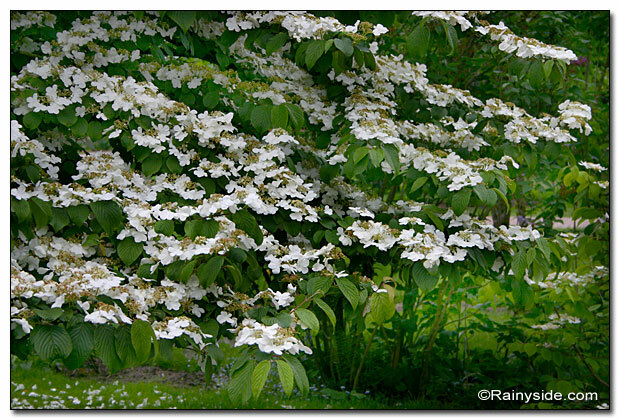 During a garden tour in 2005, I found a well-grown, well-pruned doublefile viburnum (Viburnum plicatum f. tomentosum ‘Mariesii’) at the Hulda Klager Lilac Gardens in Woodland, Washington and I mentally filed this specimen away as an excellent possibility for my own garden. In 2012 I began my search for a spring flowering small tree or large shrub, which would also give a colorful fall finale, for my side garden. The space had been cleared of a Pieris japonica and many undesirables, creating a clean palette with many possibilities. As luck would have it, I needed an autumn illustration for an article and while researching, stumbled across my spring and fall photos of this perfect solution. 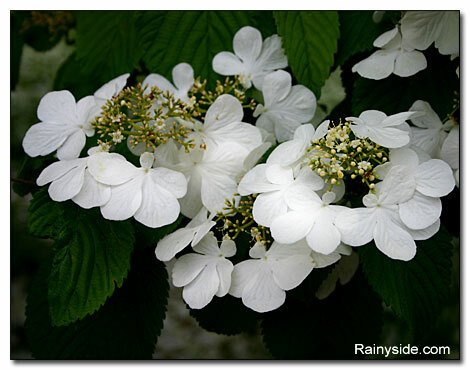 Grown as a large shrub or a small single trunk tree, this viburnum is perfect for my space, especially because of the two seasons of interest I am looking for. 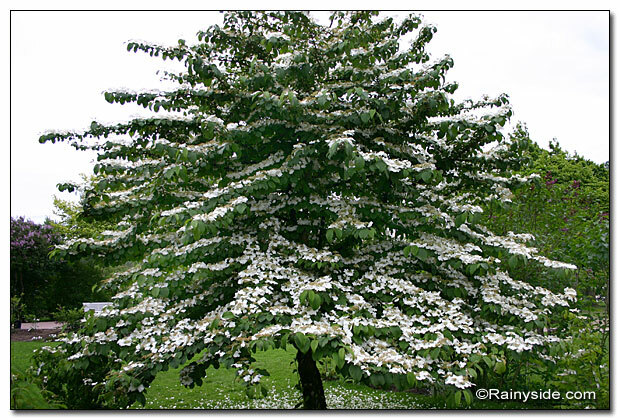 Growing eight to ten feet tall, with a horizontal tiered shape, it fills spring up with layers upon layers of snow-white, lacecap flowers. 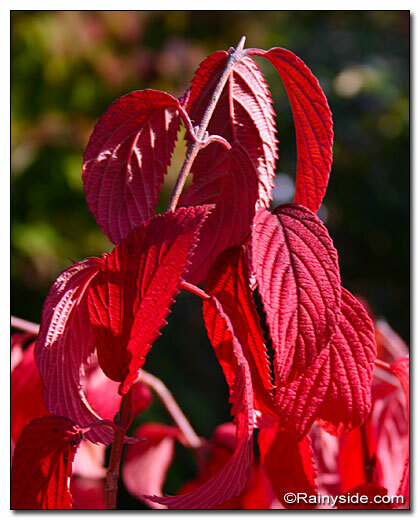 Then in the fall, the entire shrub glows with a wine-red frondescence. Even though it’s sometimes pruned to be a low prostrate form that grows remarkably wide, I recommend letting it grow to its full potential with little to no pruning. You want to give it room to grow horizontally; pruning this viburnum to remain narrow ruins its graceful form. The flowers sit on top of the branches, right below the leaves, giving a multi-tiered, layered affect. If you need something narrower, choose a skinnier shrub, or one that can take pruning to keep it in bounds. Now if you will excuse me, I must go hunt for the perfect specimen at my favorite local nurseries. After all, fall is the best time to plant most floras in the Pacific Northwest!